So now that Halloween is literally right around the corner, this will be my last festive treat! I think we're ending on a pretty good note, don't you? :) These couldn't be any easier either. I will say that I was soo disappointed that I wasn't able to find anymore Halloween Oreo's on the shelves. They would have given these that last extra special touch, but they are super cute nonetheless :) These can be made anytime of the year, and definitely dressed up for any season with the seasonal Oreo's. 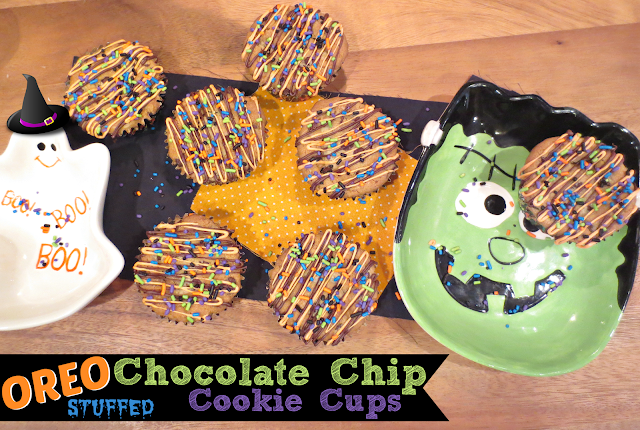 These are too cute and too easy not to whip up before Halloween next week! *Tip: These are incredible warmed up in the microwave with a scoop of vanilla ice cream! Place the cupcake liners in the muffin tin. 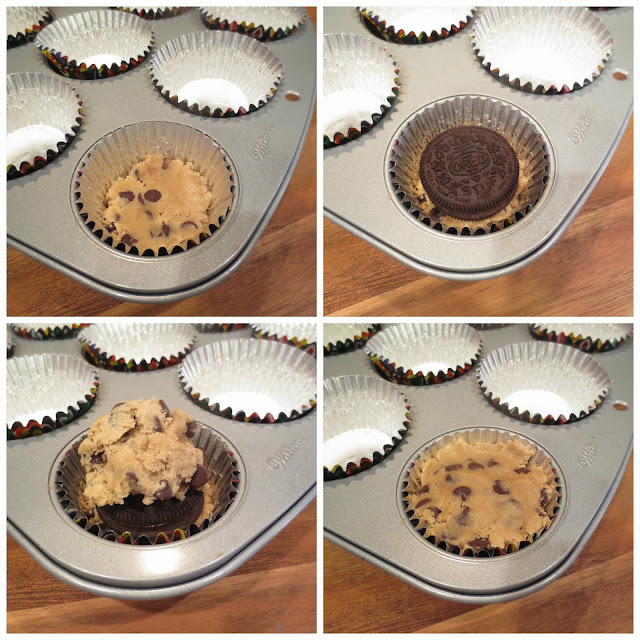 Place about 1/8 cup of cookie dough into each liner and press it down flattening it into the bottom of the liner. Place an oreo on top, then place about 1/4 cup of cookie dough on top of the oreo and spread it around the oreo and flatten it on top. Bake for 15-18 minutes or until golden brown. Let cool. Melt your chocolate chips and your candy melts and spoon each of them into their own sandwich bag and cut a small slit in the corner of each bag and drizzle on top of your cooled cookie cups. Immediately top with sprinkles.